I love reading glasses. I have never needed to wear glasses for real but love the look of them. I was excited to find the site Reading Glasses Shopper that has very cute and affordable glasses. It was taking me forever to choose a pair so when I found a pair called "The Amanda", I knew that I had to get them. Glasses called my name? Yes Please!! I really like how these glasses look and the best part is that they only cost $13.56! 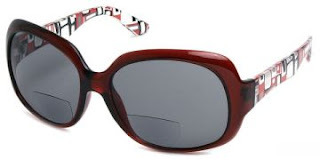 The company also sells bifocal glasses, reading sunglasses, and folding reading glasses. If you need any type of these glasses, I would recommend checking out this site! The giveaway will be for a $25 gift certificate to the Reading Glasses Shopper website. The contest is open to United States residents and Canadian residents. The giveaway is open until Midnight on Thursday November 18th. Winner will be chosen on Friday November 19th using Random.org. Visit the Reading Glasses Shopper WEBSITE and let me know what you would buy with your $25 if you won! -Like Reading Glasses Shopper on Facebook (2 entries). -Follow Reading Glasses Shopper on Twitter (2 entries). -Subscribe to the Reading Glasses Shopper Blog (2 entries). I received this pair of glasses for free for review on my blog. No compensation was given for my review. I would get The Anderson . I love the Anita glasses. I think it's so funny that you don't need them but like glasses for the fashion. That pair looked really good on you. follow you on gfc as jhb. I really like your blog the way it is! You have nice reviews and photos...I guess the only thing I would say is use your expertise in nutrition as much as possible and give us tips, recipes, recommendations about diet, etc. I would get the The Shandra Computer Reader. I would choose reading glasses for hubby, perhaps the Jamison or Jefferson style. I would love to see kitchen stuff to make my life easier. I've been wanting some sun readers. I like the Andrea style. I'd pick the Anita or the Heather. I like the Cabana Bi Focal Readin Glasses, and the ones you have pictured in your giveaway. They are fabylous! !